The Piper J-3 Cub is an American light aircraft that was built between 1937 and 1947 By the Piper Aircraft Company as an affordable trainer. The aircraft has a simple, lightweight design which gives it good low-speed handling properties and short-field performance. During the WWII, J-3 Cub was designated as L-4 Grasshopper, used extensively for reconnaissance, transporting supplies, artillery spotting duties and medical evacuation of wounded soldiers. 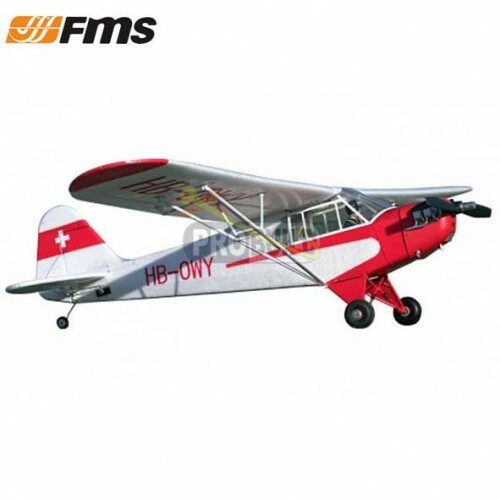 Like its full-sized counterpart, the all-new FMS 1400mm J-3 V3 has excellent short takeoff and landing (STOL) and slow speed handling characteristics. FMS has dedicated significant amount of resources in making this aircraft as detailed as possible- components such as the engine and landing gear, among many others, are replicated in loving detail. Something worth noting is that FMS has made scale floats for the Cub as a response to popular demand from the community. To mix things up a little, FMS has selected an attractive, historically accurate red paint scheme for the V3 Cub. Not all J-3’s were yellow! For pilots who are looking for an easy-to-fly, scale aircraft that has gentle trainer characteristics, plenty of power and graceful lines from the golden-age of flight- the 1400mm FMS J-3 V3 is all of that, and more. Please Note: This kit requires the following for completion: 2.4Ghz Radio System, Battery and Chargers.